What Happened to Lazarus After His Resurrection? 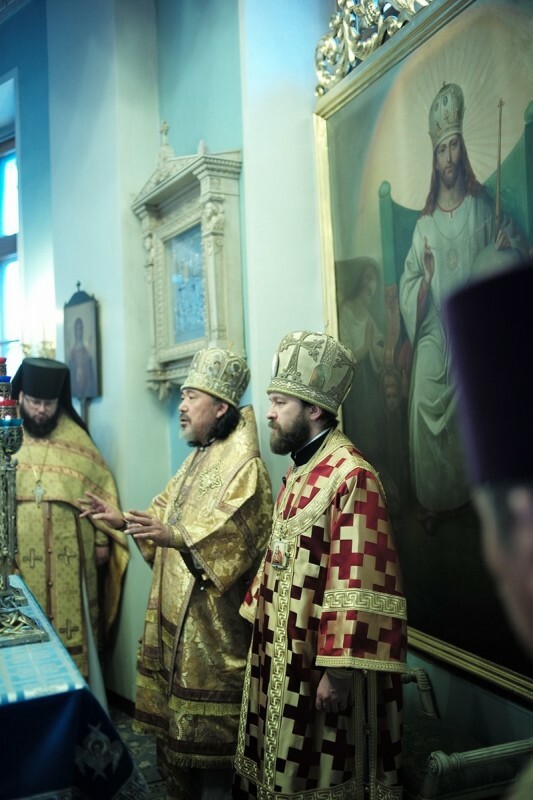 On February 2, 2014, Metropolitan Hilarion of Volokolamsk, head of the Moscow Patriarchate’s department for external church relations, celebrated the Divine Liturgy at the Moscow church of Our Lady the Joy to All the Afflicted-in-Bolshaya-Ordynka. He celebrated the liturgy together with Archbishop Seraphim of Sendai, Japanese Autonomous Orthodox Church. Among his concelebrants were also Archpriest Ioann Nagaya of the ROC Tokyo Representation, DECR staff members in holy orders and the clergy of the church. The service was held in Church Slavonic and Japanese. Speaking after the liturgy, Archbishop Seraphim said, “the Divine Liturgy was celebrated here today together with a Japanese archbishop, priest and deacon. It is a great joy for us. Voiced in the Japanese language were not only exclamations but also petitions and hymns. I am greatly moved by it. And I am grateful to the choir for singing in Japanese”. Archbishop Seraphim also mentioned Hierodeacon Nikolay (Ono), a student of the Ss Cyril and Methodius Institute of Post-Graduate Studies, saying, “We wish that he become our future, the future of the Japanese Orthodox Church”. His Eminence Seraphim presented the church of Our Lady the Joy to All the Afflicted with relics of St. Nicholas of Japan Equal-to-the-Apostles. Addressing the congregation, Metropolitan Hilarion spoke about the disaster that hit Japan two years ago, killing many people and destroying several churches of the Sendai dioceses headed by Archbishop Seraphim, and the fund-raising campaign conducted by the Russian Orthodox Church to help the Japanese Orthodox Church with the restoration of the damaged churches. “The churches, with God’s help, were restored, and we are glad that we in this church could make our own contribution to this effort”. His Eminence Hilarion also thanked Archbishop Seraphim for the priceless gift of relics of St. Nicholas of Japan. Speaking about this saint glorified as Equal-to-the-Apostles, he reminded the congregation about how the holy apostles created first Christian communities and how St. Nicholas of Japan repeated their feat by preaching Christianity in Japan. It is through his efforts that “today the Japanese Orthodox Church is a beloved daughter of the Russian Orthodox Church. She enjoys the autonomous status; she celebrates in Japanese and honours her founder, St. Nicholas of Japan Equal-to-the-Apostles”. As a token of the joint celebration, Metropolitan Hilarion presented Archbishop Seraphim with an Icon of Our Lady the Joy to All the Afflicted, saying, “We will pray that disasters like the recent one may never be repeated in the life of your flock and that the All-Holy Mother of God, the joy to all the afflicted, may help you in your apostolic and missionary efforts in the Japanese islands”.